I've wanted to wear perfume all my life, but couldn't because I got headaches every time I put it on. Here's how it would go –> I'd meet someone whose perfume I noticed and loved. I would ask her what it was. I would then get a sample and try it out, only to stop almost right away because of the headaches. I can't tell you how many times this happened. Too many to count. I'm sure I'm not the only one for whom conventional beauty products are toxic! 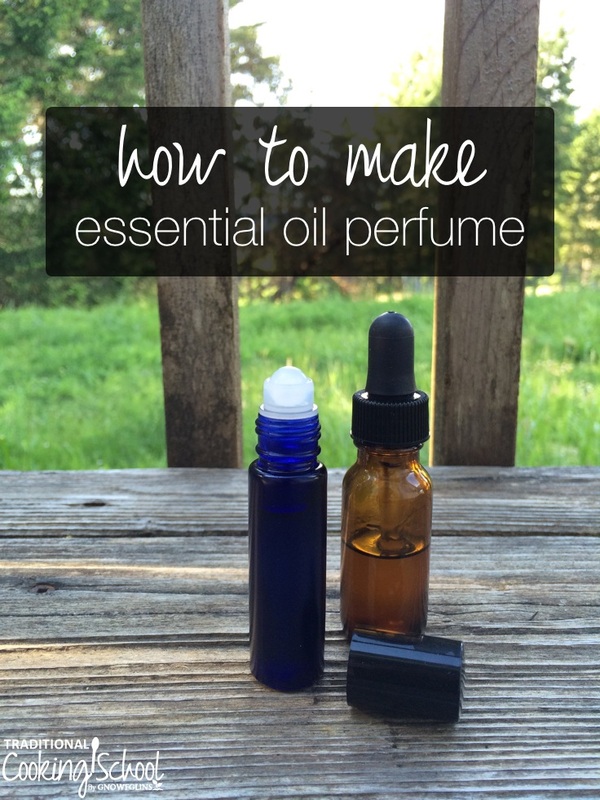 So recently, I started making my own essential oil perfume… and I couldn't be more thrilled. Now I can wear perfume without getting headaches. And in fact, my perfumes usually improve how I'm feeling! And, I am making fragrance blends that are truly me — I love my homemade blends more than anything I've ever smelled. They make me happy. And they make me feel good. And they're good for me. It's just amazing all around. Be sure to choose essential oils that are safe for to put on your skin (when using a carrier oil). Also, check for contra-indications with any essential oil you might want to include in your blend — such as for babies, pregnancy, or other health conditions. I really like (and turn to) The Complete Book of Essential Oils and Aromatherapy any time I want to look up or double check essential oil usage. 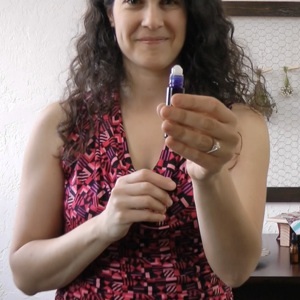 Homemade essential oil perfume! So easy and so lovely. You can even experiment with your own blend. Enjoy! Put essentials oils in roll-on bottle. Add jojoba oil (or whatever carrier oil you’re using) to fill to the shoulder of the jar. Or, if using a 15ml bottle, fill to 2/3 full. Add the roller ball top — use a towel to help you push it down into the jar all the way. Then put on the lid that screws in place. To use: Shake gently, then apply. Keep capped when not in use and preferably stored in a dark, cool location. *This is a recipe for one of my favorite perfume blends. Feel free to make your own blend -- just shoot for 30 to 40ish drops total of essential oils per 10ml bottle. Work up or down from there to make it stronger or weaker to suit. 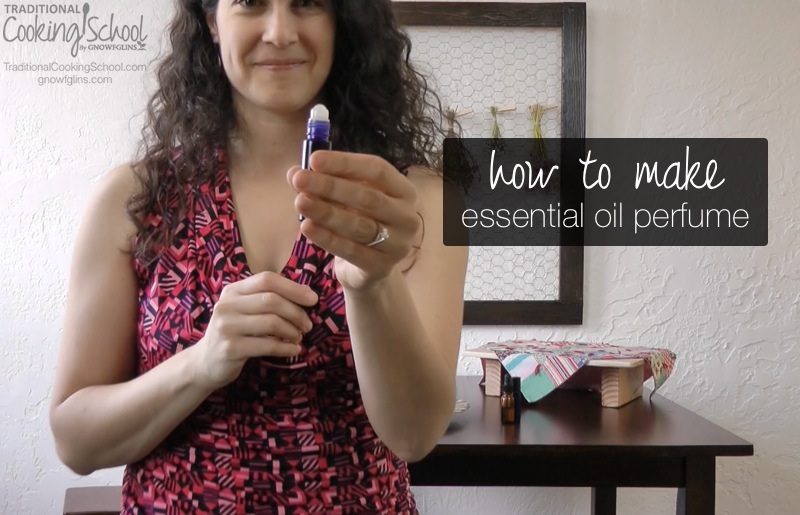 Have you made essential oil perfume? What's your favorite fragrance blend? Hi Wardee! I, too, get a severe headache from perfume, lotions, shampoos and anything with alcohol in. When I try to have a mixed cocktail, I get a hangover headache within 2 sips. I think we’re allergic to alcohol. I have found a few perfumes that I can wear, but they can’t have any alcohol in them. I also have trouble in the laundry detergent/fabric softener aisle at the store. I’ve been thinking about making my own perfume because I’m almost out of the perfume I have and it’s no longer available from Avon. But I’m not fond of vanilla, so I will probably go with a lavender, rose geranium and frankensense blend. I’m really getting addicted to Frank… I’ve been using it twice daily to get rid of a wart on my upper thigh. Love the smell. And I love roses. Sooooo, we’ll see what I come up with. Thanks for all your interesting solutions to everyday problems. Bonnie — Is the Frankincense working for you on that wart? I love the smell of it, too. Thanks for sharing your idea for a perfume blend — it sounds beautiful! I hope you love it. I LOVE the idea of making my own perfume and I have most of the items needed including the orange essential oil. Just curious but what vanilla blend do you use? That is one thing I haven’t thought about buying before. Brandy – I purchased a vanilla blend from my favorite EO source. If yours doesn’t have one, I have seen recipes online where you can use vanilla extract. The only thing I worry about with that is whether the vanilla will really mix with the carrier oil. Perhaps it’s worth a try, though. Enjoy! Hi Wardee! I love all your posts! I started making my own essential oil perfume with a grapeseed oil carrier. I do like the idea of sweet orange and vanilla though!! Might try that! Thanks for all you do to educate and help people learn to rid their lives of toxins! Another amazing tutorial here. I am going to definitely make my own perfume. What a neat little roller ball dispenser. Have a great day and blessings to you and yours as you bless and share with us! Jamie — There’s a roller ball headed your way sometime soon. I can say that because we are practically neighbors. 😉 Let’s make perfume together sometime soon. P.S. to everyone — Jamie is the one who made the chicken wire frame behind me in the videos. I love it so much. Thanks for sharing! 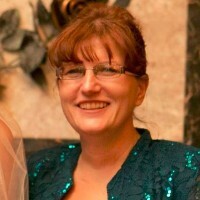 I am thrilled to start using EO. Enjoying the learning experience. I just used up an orange/vanilla blend perfume that I’d purchased at a store and really enjoyed. Love the idea of adding ylanylang and patchouli to make my own! Getting the roller ball in was challenging enough – but what about removing it from the bottle in the first place. Tips? I think I’d really like the combination of scents you used, but I’m wondering about phototoxicity due to the orange oil. This time of year, I never know when I might ending spending a bit of time outside. Any thoughts? Suzanne — I don’t know the answer to this, I’m sorry. What are you thinking? Sweet Orange (citrus sinensis) essential oil is a cold-pressed oil and is not phototoxic. So I just got an order of essential oils for various uses but this is the first thing I made with them and I immediately rolled it on. A few minutes later, my six year old asked me if he could take the perfume bottle downstairs with him to play lego because he really liked how it smelled! So rolled a little on his wrist (don’t tell my husband I put perfume on his son!) but I’m thinking I’ll have to adapt this recipe for an air freshener spray! Can I use vodka/water as carrier instead of carrier oil? This will probably be fine, but you will want to google some sample recipes to find out the ratio. And also use a sprayer, not a roll-on tube. Hi everyone, love your recipe suggestions everyone ???? I, personally, use Young Living Essential Oils and Love them! Someone asked about photosenativity. We do have to be aware when using essential oils with regards to photosensitive oils. You can Google the oil to see if it is or not. Thanks for your blog sweetie! ??????????? ?